Drivers faced hazardous road conditions in North and West Yorkshire when up to 4cm (1.5in) of rain fell in one hour during heavy downpours. The flash flooding resulted in dozens of emergency call-outs, submerged roads and caused delays on rail journeys between York and Manchester. In Scarborough, drains overflowed and the fire service had 50 firefighters handling incidents throughout the town. Three flood warnings were put in place for Leeds, but have since been removed. 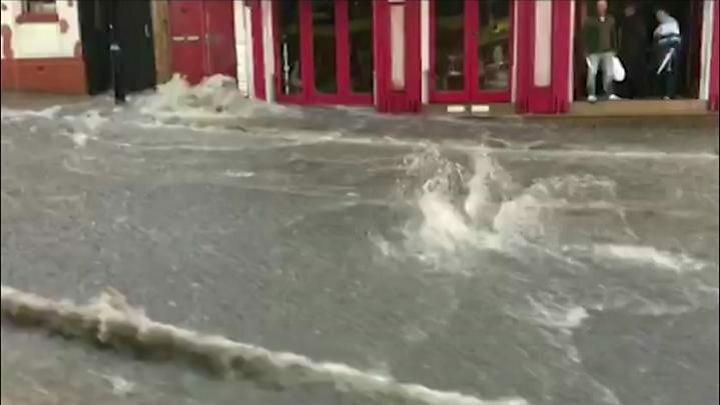 West Yorkshire Fire and Rescue Service said it received 23 flood-related calls between 09:00 and 11:00 BST, with sandbags used to protect homes on Parker Road in Dewsbury. The call-outs included three people stuck in vehicles and a lightning strike damaging a property in Wetherby. North Yorkshire Fire and Rescue Service warned of standing water on Valley Road in Scarborough, with drivers told not to drive through a flood if the depth of water was not clear. At its height, the service warned it was experiencing "spate" conditions, meaning the number of incidents was outstripping the resources available. In York, Fishergate was closed to traffic and pedestrians with bus services having to be diverted. 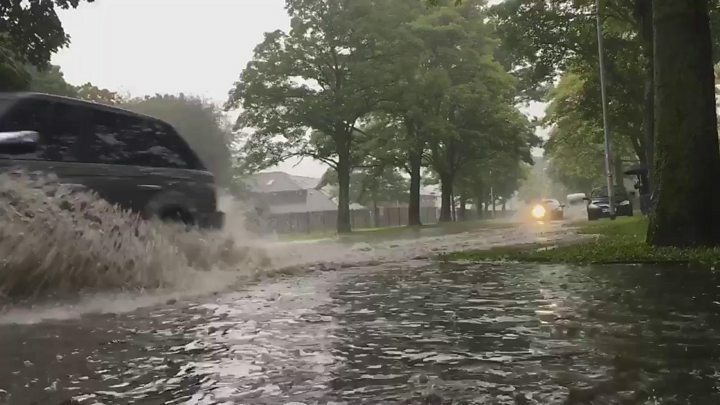 Flood warnings were put in place in Leeds close to the A64 York Road in both Gipton and Halton, with a further warning near the A58 Easterly Road in Fearnville. At an ASDA supermarket in Killingbeck, water falling on the concourse came in the store's entrance. The Yorkshire Sculpture Park in West Bretton, Wakefield, was forced to close a gallery "until further notice" after the flood. The Met Office said a weather station at Bramham recorded 4cm (40mm) of rainfall in an hour between 10:00 and 11:00 BST. "This band of rain while heavy is fast moving and is clearing through quite quickly," a spokesman said.